Nucleonica Blog » Decay engine: daughters present at time t=0? Decay engine: daughters present at time t=0? (Qu.) If we take Ra-224 as an example I can set the starting quantity (N0) of Ra-224. The other nuclides in the chain start with N0 = 0. But If I also have an amount of say Pb-212 at t= 0, i.e. N0 is not equal to 0 at t= 0. Is it possible to do this in the Decay Engine? (Ans. Nucleonica Team) This is straightforward in Nucleonica. 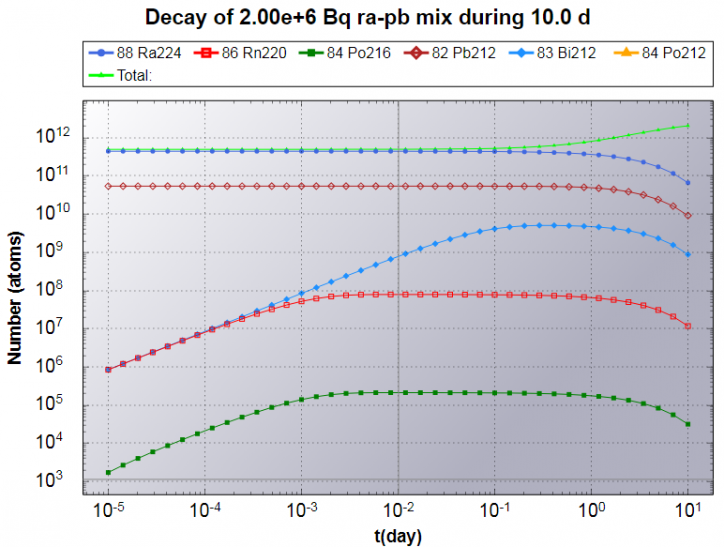 You first create a nuclide mixture with say Ra224 (1 MBq) and Pb-212(1 MBq). Then save with the name e.g. Ra-Pb mix. You then go back into the Decay Engine and click on the Mixture Selection. You should then see the Ra-Pb mix in the drop-down menu. It may be necessary to refresh the page so this the new mixture is loaded. Then you can redo the decay calculation with the mixture. The results are shown below.